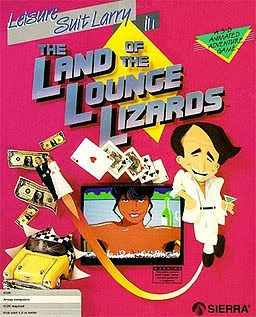 Leisure Suit Larry in the Land of the Lounge Lizards is the first game in the Leisure Suit Larry series. It is a graphical remake of the text adventure Softporn Adventure. It is an adult adventure game where a virgin, who is approaching 40 years old, hits on women all night before he finds one that will both sleep with him and enjoy his company. The game was released on July 5, 1987 as a keyboard controlled graphical adventure game with a text parser using Sierra's AGI engine. In July 1991, it was remade as a point-and-click adventure game with remade art in 256 colors using Sierra's SCI engine. Replay Games released a new remake, Leisure Suit Larry: Reloaded, on June 27, 2013. The Replay Games remake has an engine designed by N-fusion, and has high definition graphics in the style of later Leisure Suit Larry games, as well as new orchestrated music, new dialog and puzzles, and a new scene with a new woman. The original AGI version and the SCI remake (the 1991 remake, not the 2013 Replay Games remake) of Leisure Suit Larry are now supported by ScummVM, a program designed to let 2D adventure games run on multiple platforms. With ScummVM, Leisure Suit Larry now runs on modern versions of windows, as well as Linux, Mac OS X, and many consoles such as Dreamcast, Wii, PlayStation 2, and PlayStation Portable. For a complete list of platforms supported by ScummVM, see here.